7.0ft³ Bench Oven with Digital Controller, 450°F Max - Gilson Co. 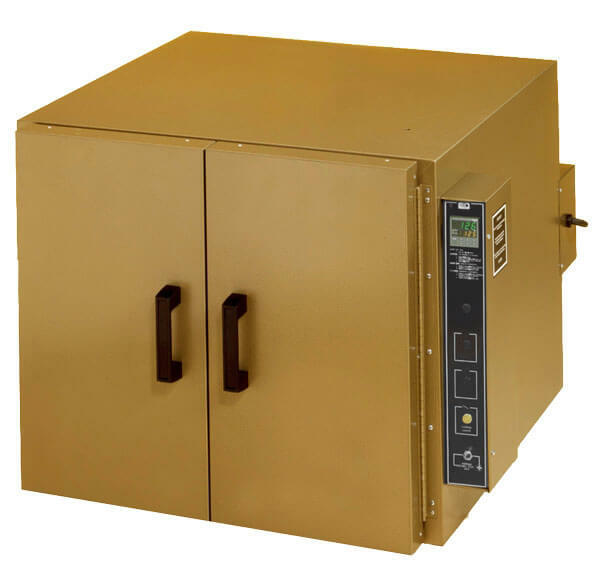 The BO-350ER forced-air convection Bench Oven has a 7.0ft3 (198L) capacity, 450°F maximum temperature and ±2.0°C uniformity for drying and controlled heating applications. Models are equipped with a digital controller. Oven holds up to 11 shelves with 80lb (36kg) capacity that can be adjusted on 1.5in centers and The PID Microprocessor Controller with digital display offers greater uniformity, repeatability and resolution. This precise microprocessor with a J-type thermocouple holds set temperatures accurately to ±1° F or C with improved chamber uniformity. Control features include large easy-to-read dual LED display in °C or °F units, showing both set and process temperatures. Auto tune feature optimizes PID oven performance for various loads and applications. A simple On/Off control mode allows fast recovery times and processing of batch-style loads. BO-350ER and BO-350ERS models operate at 115V/50-60Hz, and come with cord and NEMA 5-20P plug. BO-350ERF and BO-350ERSF operate at 230V/50-60Hz and are supplied with a NEMA 6-20P plug. BO-350ERF and BO-30ERSF models are equipped with a factory-installed stainless steel interior. Inquire for optional factory installed 12-Hour Timer for Bench and Lab Ovens to shut off operation at a preset time up to 12 hours. A Hold feature allows for continuous operation. 12" Sieve, Brass/Stainless, Half Height, 3/8"
12" Sieve, Brass/Stainless, Half Height, 3/4"
12" Sieve, Brass/Stainless, Half Height, 1/4"
12" Sieve, Brass/Stainless, Half Height, 1/2"